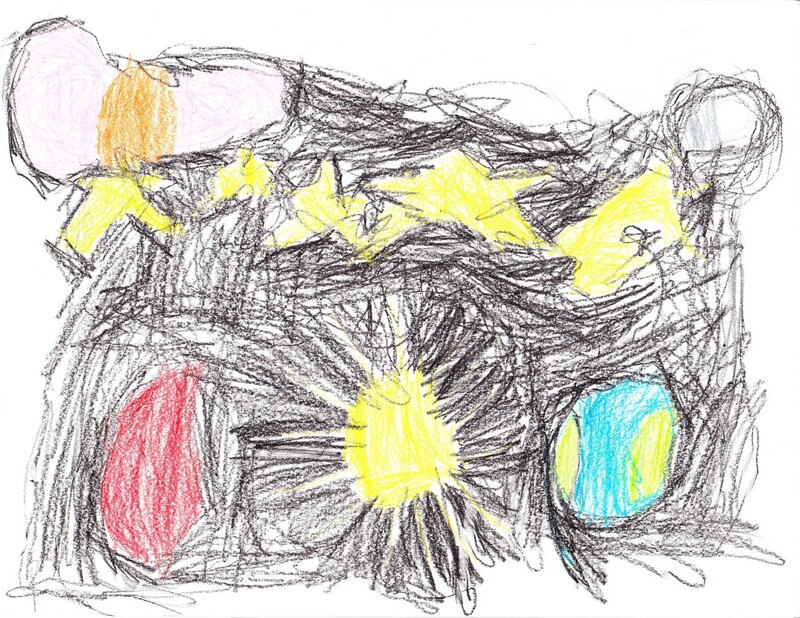 The picture above is Alyce's rendering of our solar system. She drew this today at the house. In the bottom right hand corner is Earth; see the green and blue? In the middle on the bottom is the sun. The bottom left is Mars. Upper left with the orange center is Saturn. The stars cross the picture. And finally the black circle with a white center in the upper right is the moon. It is partially shaded to show the dark and light side of the moon. The amount of detail in one picture just floors me. We've been reading a book that talks about the planets and she's watched a few television shows focused on the planets but this is more than I expected. Oh and Jupiter is supposed to be in there as well but it was too big to fit on the page. 0 comments on "The Solar System"